In a place known for them, today on the Île Notre-Dame for qualifying for the latest Canadian Grand Prix we got Groundhog Day. 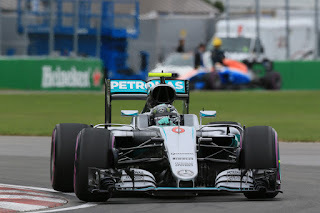 For what seems the nth time in 2016 we entered a qualifying session clinging to the hope that Mercedes might have something to think about. The recently-resurgent Red Bull and upgraded Ferrari had looked good in Saturday morning practice; a multi-make battle for pole looked like might just be in the offing. But in what is about as regular an occurrence this season Mercedes dashed such hopes. And in that recurring way it did it at the same point it almost always does it - during Q2 the silver pair made their stride clear of the rest. Suddenly they were half a second or more clear; for all others it was a battle for third at the most. You could start to set your watch by it. And at around this point too the local specialist Lewis Hamilton made his own move. The times tumbled throughout the session but Lewis's 1m 13.076 in Q2 sent a few reverberations around. Still, Nico Rosberg's time was a hair's breadth off it. 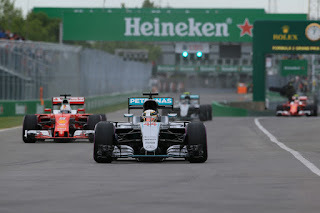 Then in the first Q3 efforts Lewis shaved another couple of tenths off for a provisional pole mark of 1m 12.812, though again Nico was well within a tenth of it. Some even started to talk of the all-time track record of 1m 12.275, from 2004, being vulnerable. The record was safe though, in part as things ended on a curious, anti-climactic note. Lewis didn't improve his time on his final run, but on this occasion Goddess Fortune smiled on him. As even by then Nico had abandoned his own final lap, after getting turn 1 very wrong. Lewis then Nico will be tomorrow's front row. Lewis didn't have much luck in the early part of this campaign, but he's getting some of it back more lately. And neither Merc pilot was concealing afterwards that they'd rather stumbled across the line today. Both indeed had a suitably incredulous air. "Yesterday was a really good day for me in terms of pace" he went on, "today I didn't have the same pace as I had yesterday, I don't know if it was a set-up change I made or what. But still it was obviously enough, but not as much as I'd like. "Yesterday I had like a half a second buffer to Nico, and then it diminished a lot, I think he gained some and I lost some. "It's not the best pole position lap I've had, and the second lap should have been better and it wasn't". But despite his apparent harshness the end result is the same, as the man himself had outlined earlier: "To be honest it doesn't matter how far you are ahead, as long as you're ahead". As for Nico's error on his own final effort, "I was hoping you hadn't seen that one..." he grinned. "First lap in Q3 was good, not quite enough to beat Lewis but it was still a good lap. Next one I tried to pull one out of the bag, but it didn't work out and that's it." He seemed fairly content with his place however. Perhaps like Lewis he recognised that he'd got away with it today somewhat. Perhaps as his boss Toto Wolff outlined it was an achievement to run Lewis so close on what has been very much the Englishman's fiefdom historically. 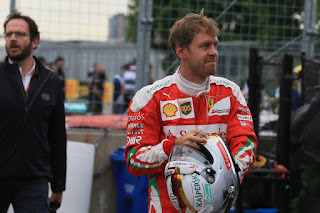 Perhaps though it reflects that here in Montreal races even in the normal run of things rarely are straightforward follow-my-leader affairs, and that tomorrow there's a particular reason to think it'll be even less straightforward than usual. But more of that later. The day very nearly took an unexpected late turn though. In another recurring theme of this season Ferrari didn't convert topping FP3 into a front row start, and much of the quali hour looked a little desperate for the red cars in that creepingly familiar style. But Sebastian Vettel at the last so nearly snatched a ball from at least one of the fumbling Merc pilots, with an effort that was just over a tenth off Nico's and within two tenths of Lewis's. His so near and yet so far view was clear in his words on his cool-down lap. "I tried guys, I tried," So we saw Seb. "Lost a bit of traction out of the hairpin, but...not enough, not enough". It was a point he expanded upon in the post-quali press conference. "I think going into qualifying I thought it [pole] was possible" Seb reckoned. "As a driver you always feel that there's a little bit more. On my last lap I was very happy with the lap in general. I was maybe a bit greedy out of Turn 10, and maybe a bit not greedy enough into Turn 6. There wasn't an awful lot to grab. "Otherwise, very happy. I wanted to get below the 1m 13 mark because then I knew it would be very close with the Mercedes. I did that, but just by one-hundredth, so a little bit was missing. 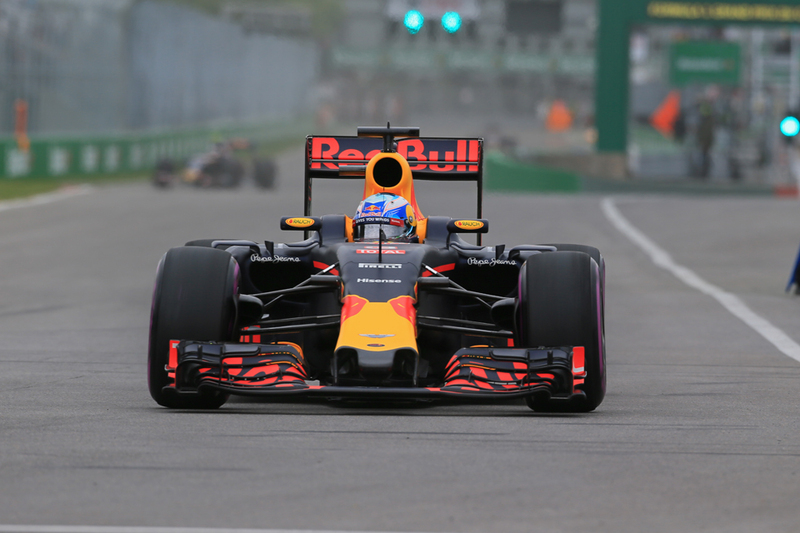 Overall I think we have a great car, we did a step...I felt in general very comfortable and enjoyed qualifying a lot." So the Ferrari upgrade gave a boost after all? Perhaps, though there was a wider sense around that it might have been more a Seb lap than a Ferrari lap (for what it's worth Kimi Raikkonen was six tenths away from Seb and will start P6). "Vettel pulled one out" noted Wolff as the dust was settling. As noted too the Mercs didn't max things out, something that Lewis estimated as two tenths in hand. Red Bull couldn't repeat its Monaco Saturday triumph at a circuit with similar slow speed corners but much longer straights between them, though the pair managed to occupy a reasonably healthy next up with Daniel Ricciardo getting P4 just over a tenth-and-a-half off Vettel, and Max Verstapppen in P5 a quarter of a second shy of his team mate. The speed trap marks suggested that they weren't ceding all that much to those with Merc or Ferrari power, though Verstappen admitted that "here we have to compromise a little bit for the straights, it's not as good as Monaco..." Ricciardo did tap the infamous Wall of Champions on his final run but stated afterwards that while "it felt like a pretty big kiss actually" it hadn't in his estimation cost him a place. Otherwise there wasn't much to report from Milton Keynes way. "This weekend was steady" said Ricciardo, "I think we just build up to it and found a better rhythm in qualifying...just made sure I got it all together and in the end I was pretty happy with fourth and with the pace". The anticipated rain didn't arrive in qualifying apart from the odd minor leak, but the consensus is growing that tomorrow's race will have much more of the stuff. And we know from experience, particularly that gathered in 2011, that in that situation form doesn't count for all that much. Nor, necessarily, does sanity. "For tomorrow, everything is still possible", said Nico in this ilk, "the weather forecast is all over the place", while Wolff added that "if it rains whatever is the qualifying result today is not relevant anymore". 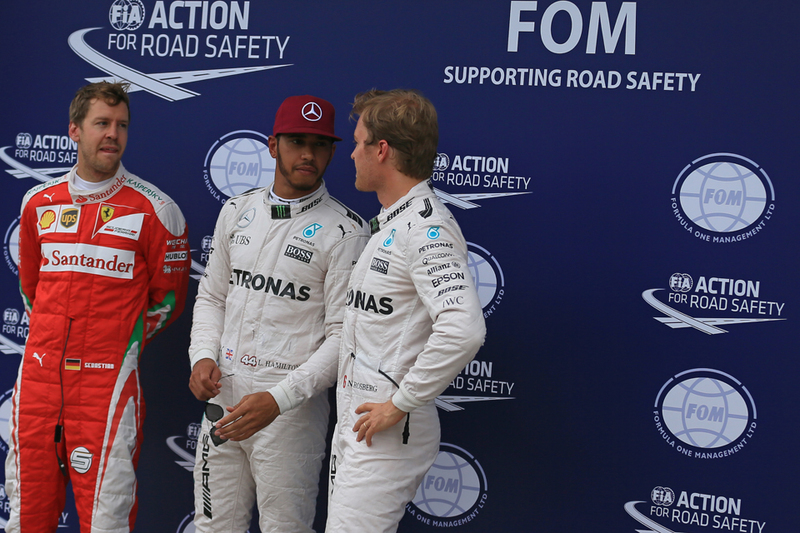 Lewis spoke of a "lottery" and Ricciardo of "anyone's race" in that scenario. In recent times the Red Bull has been the car to have on a wet day, though they have cars to clear. And Lewis reminded us indeed that while "it's going to be interesting tomorrow" that pole also is "the best place to start, that's for sure..."